A search of APImages.com for “Ted Cruz” no longer yields a handful of photos from photojournalist Charlie Neibergall wherein the barrel of a gun on a poster points to the U.S. Senator and presidential candidate’s head. A screenshot of the latest search results for Senator Cruz show nine photos from the “Celebrate the 2nd Amendment Event” in Iowa where he spoke on Saturday, June 20th, then photos begin from his appearance at the “Road to Majority” event in Washington, DC Thursday, June 18, 2015. 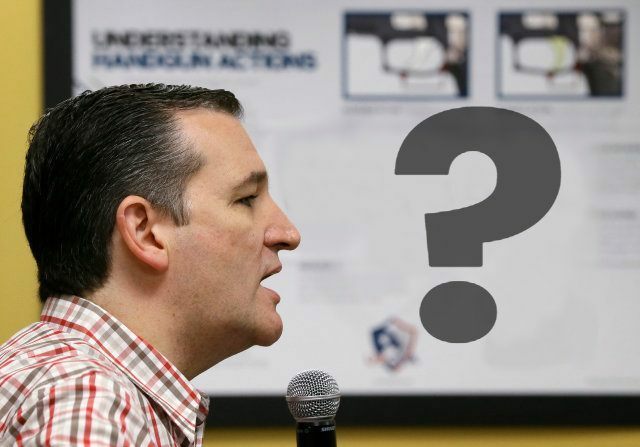 The controversial gun poster images from the Iowa photo op are nowhere to be found. Several URLs to the gun poster photos, hyperlinked in Breitbart’s coverage, are now broken links. Image links here, here, and here bring up the message, “Oops! This image is not part of your portfolio. Please contact Customer Support.” The message is the same with or without a username logged in to APImages.com. A phone call to Customer Support yielded no comment to Breitbart News; the employee on the line immediately transferred the call to an AP media relations representative. On Saturday The Associated Press distributed a series of photos to our member news organizations and other subscribers showing Sen. Ted Cruz at a gun range. The images were not intended to cast the senator in a bad light and they remain available for use by those who received them on Saturday through our photo service. Five of the photos show Mr. Cruz with images of a pistol pointing at his head and upon consideration we have decided to remove those photos from further licensing through AP Images, our commercial photo syndication business.